APPLICATIONS TO OPEN IN JUNE 2019! 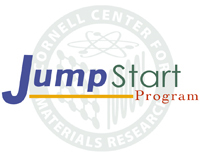 Through collaborations with Cornell experts and with matching funds from NY State, the JumpStart program helps NYS small businesses solve identifiable problems related to materials. JumpStart projects may involve up to $15,000 in project costs apportioned as 33% CCMR-NYSTAR funds, 33% company cash, and 33% company non-cash contributions (such as employee time, materials, travel expenses, and other expenses). Alternatively, the non-cash contributions can be less than 33%, with the proportion of the company cash contribution correspondingly increased. CCMR JumpStart Case Studies demonstrate outcome and benefits for NY State small businesses.